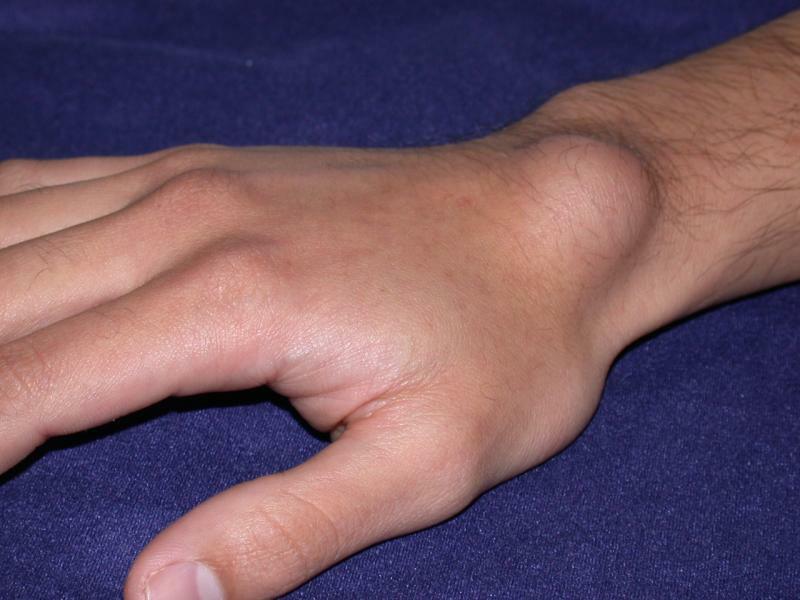 A ganglion cyst is a very common benign mass arising in the hand. These cysts usually arise near a joint or tendon in the hand and wrist. The most common location is the back of the wrist (dorsal carpal ganglion). They can occur in people of all ages and are common in young adults. The cause of a ganglion cyst is unknown in most cases. One theory proposes that the cyst arises from joint fluid which has leaked from a small opening in the joint capsule. The cyst is filled with a thick, jelly-like fluid and usually has a stalk which connects with a joint or tendon sheath. Many patients report that the cyst fluctuates in size, and in some cases the cyst can go away on its own. Most ganglion cysts are diagnosed by history and physical exam by a physician. Since ganglion cysts are fluid-filled, a light shined directly on the mass will trans-illuminate the cyst. X-ray, ultrasound, and MRI are not required to make the diagnosis in typical cases. 1. Observation: Since ganglion cysts are benign (not cancer), surgery is not required to remove them. Cysts which are not painful and do not interfere with function can be left alone and monitored. If the cyst becomes larger, painful, or interferes with function, further options should be discussed. 2. Aspiration: The cyst can be punctured and the thick fluid removed using a needle under sterile conditions. This is a quick procedure which is performed in the office. There is a high chance that the cyst comes back, however. There is a small risk of bleeding, pain, and infection from this procedure. 3. Excision: Excision of a ganglion cyst is performed in the operating room and requires an incision. During surgery, the cyst is removed including the stalk which tracks down to the joint. Removal of the stalk reduces the chance of recurrence, since the root of the problem is addressed. See below for more information. What is the recovery from ganglion cyst excision surgery? Ganglion cyst excision is performed on an outpatient basis. Most people can return to light duty work in a few days as the pain and swelling subside. Occupational therapy is sometimes helpful after this procedure to improve range of motion and strength. Patients should avoid forceful use of the hand for approximately 4-6 weeks after surgery. Normal use of the hand is resumed as comfort allows.